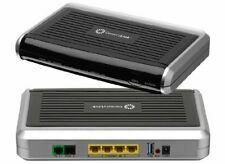 Zyxel C1100Z 802.11n VDSL2 Wireless Gateway for CenturyLink. 1 C1100Z Modem. The C1100Z also features 802.11n technology with 2T x 2R antennas which provides the ultimate solution: improved speed, reduced dead zones, and extended coverage. I do notice a notable speed increase from my other router. Useful features for normal use. Netflix stream with no buffering. I do recommend this router !!! The modem works pretty good. As for download (less than 10 mbps) or upload (less than 1.0 mbps) speeds, Not being sure if it's the poor CenturyLink (the only provider available) phone lines connected to our residence or the modem itself, I had to give it only 3 stars. I was able to take this Centurylink Zyxel C1100Z 802.11n VDSL2 Wireless Modem Router straight from the box, hook it up, follow the setup instructions, and became operational the first time - as promised. Exactly as described and Thank You. Works the way I expected it to. It is used but in good condition. The lack of an adaptor is a bot of a bother, but was able to find one. Product in great shape and works great.